Captain Lance and his crew have over 50 years combined deep sea fishing charter experience across St.Maarten, the Caribbean sea to the Atlantic Ocean. 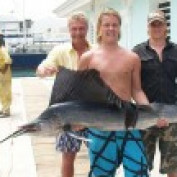 Captain Lance started deep sea spear-fishing at the age of 9 with his brothers and friends in Curacao (Netherlands Antilles). At the age of 15 he started competitive deep sea sport fishing. Captain Lance is considered a walking encyclopedia of deep sea fishing. Visit our picture gallery where you will find a variety of fish pictures caught in St Maarten on our fishing charter with our guests from aroung the world.